This is an English version of the original article written in French about Yana Khachikyan, readable here. Sorry for bad englando, I will try my best to convey the same feelings as I did in my native language, but, you know… Language barrier and vocabulary are not easy to deal with. If something seems wrong, just leave a comment and I’ll edit this post. Anyway, let’s dive into it! 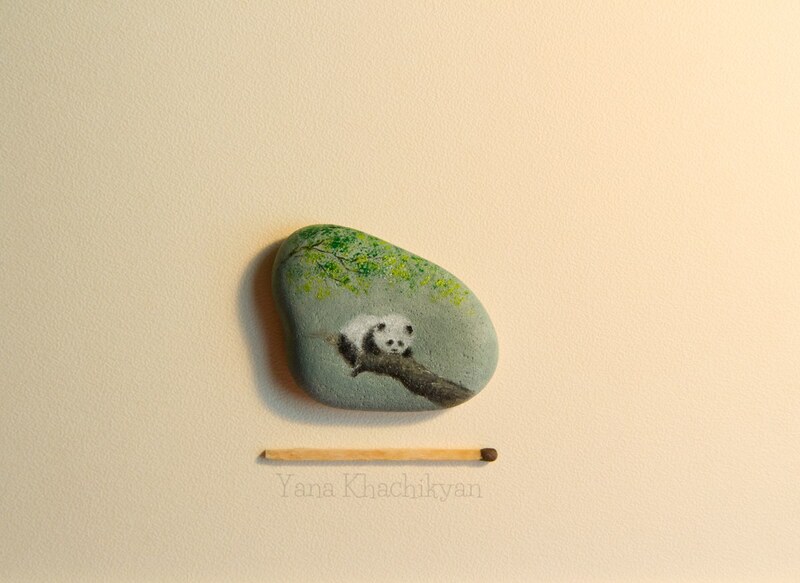 This week, we completely change media, going from canvas to pebbles, with Yana Khachikyan! Before admiring her art pieces, each cuter than the previous one, I admit that it has been difficult if not impossible to find any valuable information about her artist’s life apart from some basic stuff. Please thank Google Translate which’s been mad when I showed it some Russian. From the exchanges I’ve had with the artist (who’s very pleasant, by the way), she is Armenian, half Ukranian. 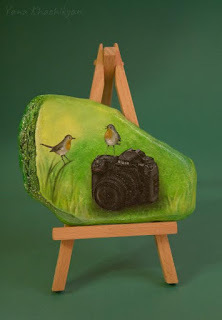 Anyway, we know she started this project about two years ago and by now, she has close to two hundred tiny painted stones to her credit. There is a kind of fragility, delicacy in this medium. 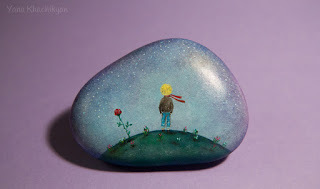 The pebble we used to throw onto the water to make it bounce stops and portrays a calm and quiet scene. Pastel colours, having bluish and greenish shades, are helping to convey this feeling. 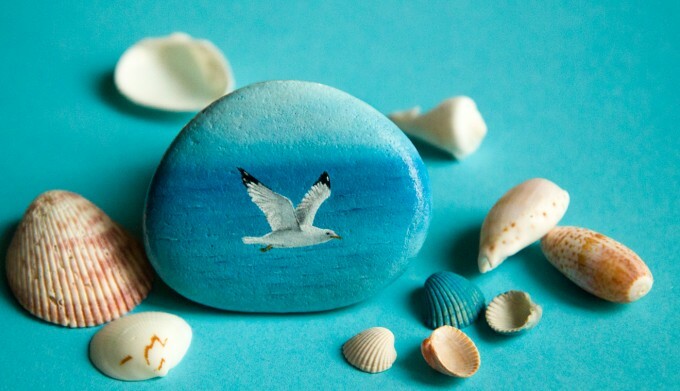 If I ever picked a pebble like that on the beach, I would definitely not throw it away. 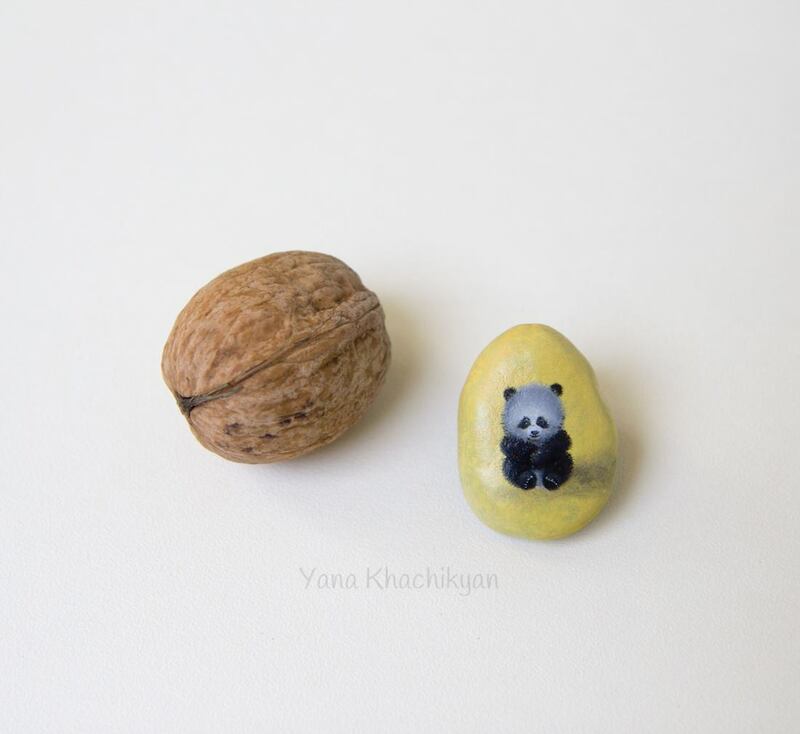 This is probably what convinced me to show you Yana Khachikyan’s work (not mentioning my girlfriend who fell in love with these pure pieces of cuteness). There is a real cesura between my own, violent, experience of the media, made of speed and trajectory, and her use, tinted by hours of patience. Maybe that’s all the charm of these representations : they’re softly put onto a stone which’s been waiting for ages in a river, getting slowly polished by the water. Moreover, I merely enjoyed the city’s onirism, between sea and sky. 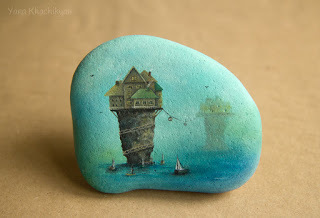 Honestly, scenes of British gardens and « sooo cuuute » animals « how could you be so heartless » don’t have the same effect on me, compared with the simple tower of rock painted onto a polished stone. 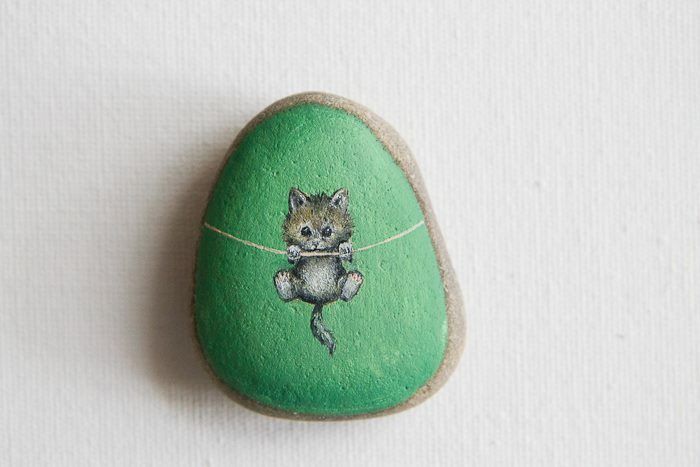 Well, as we can not avoid it… I willingly show these little fluffy things! Please note that we can get an idea of the size of Yana Khachikyan’s work. 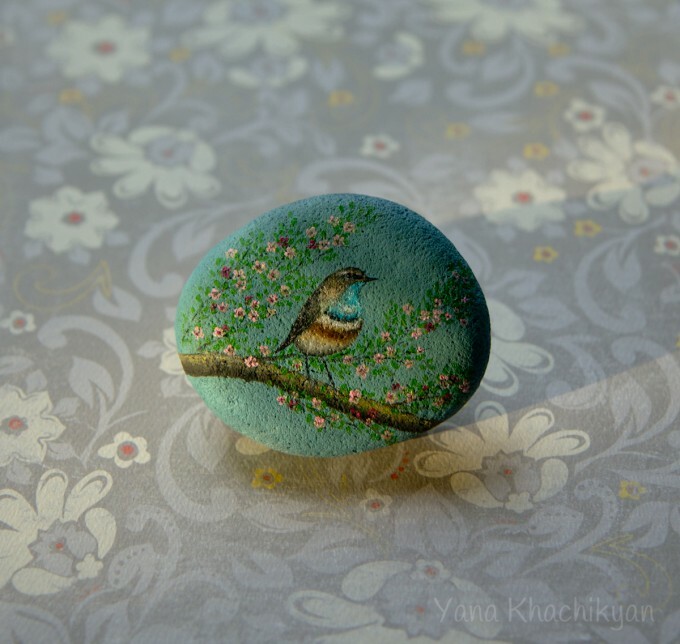 As she doens’t seem to communicate (in English at least) about her way of creating the painted pebbles, I have to cut the usual part dedicated to the artist method. 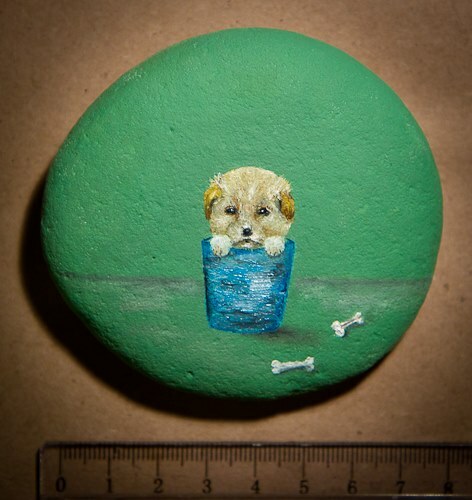 I can only say that she uses oil painting and varnishes the tiny stones. 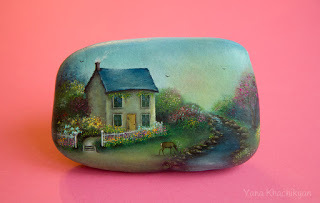 If you enjoy this kind of art – it’s fairly easy to try it at home, you « only » have to know how to use brushes and colours -, many tutorials exist on the net. – firmly grab the pebble and joyfully smear it! – enjoy (show it to your workmates, they’ll get jealous). Also… Thanks Yana Khachikyan for asking for this English version and calmly explaining to me what was wrong with the last one. It has been fun and educational so far. If you have something to say (from your opinion to undiscovered art treasures you may know), leave a comment below or contact me on Twitter & Facebook.